Deployment diagrams are used to visualize the hardware processors/ nodes/ devices of a system, the links of communication between them and the placement of software files on that hardware. In this UML deployment diagram tutorial, we will cover what is a deployment diagram, deployment diagram notations and how to draw one. You can use one of the editable deployment diagram examples to start right away. If you are deploying to the cloud, you may skip UML altogether and use something like our AWS architecture templates to achieve the same purpose. A deployment diagram is a UML diagram type that shows the execution architecture of a system, including nodes such as hardware or software execution environments, and the middleware connecting them. Deployment diagrams are typically used to visualize the physical hardware and software of a system. Using it you can understand how the system will be physically deployed on the hardware. 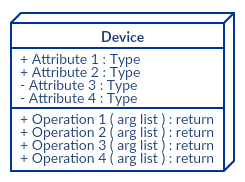 Deployment diagrams help model the hardware topology of a system compared to other UML diagram types which mostly outline the logical components of a system. In order to draw a deployment diagram, you need to first become familiar with the following deployment diagram notations and deployment diagram elements. A node, represented as a cube, is a physical entity that executes one or more components, subsystems or executables. A node could be a hardware or software element. Artifacts are concrete elements that are caused by a development process. Examples of artifacts are libraries, archives, configuration files, executable files etc. This is represented by a solid line between two nodes. It shows the path of communication between nodes. A device is a node that is used to represent a physical computational resource in a system. An example of a device is an application server. Deployment specifications is a configuration file, such as a text file or an XML document. It describes how an artifact is deployed on a node. Follow the simple steps below to draw a deployment diagram. 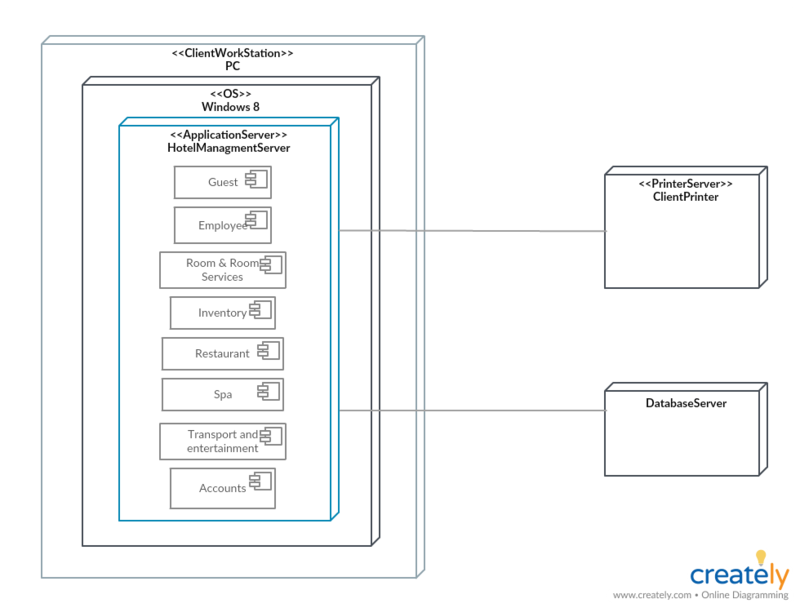 You can either use the deployment diagram examples below to get a head start or use our UML diagram tool to start from the beginning. Step 1: Identify the purpose of your deployment diagram. And to do so, you need to identify the nodes and devices within the system you’ll be visualizing with the diagram. 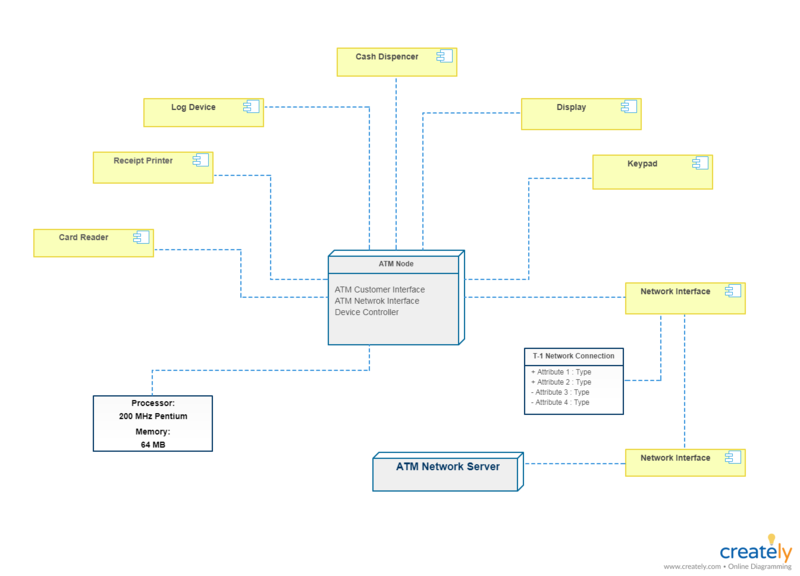 Step 2: Figure out the relationships between the nodes and devices. Once you know how they are connected, proceed to add the communication associations to the diagram. Step 3: Identify what other elements like components, active objects you need to add to complete the diagram. Step 4: Add dependencies between components and objects as required. 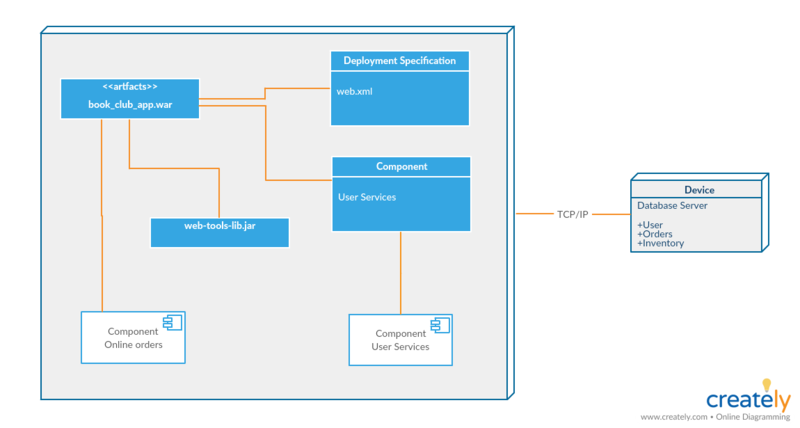 In this deployment diagram tutorial, we have covered everything you need to know – from what is a deployment diagram to deployment diagram elements – to draw a deployment diagram yourself. 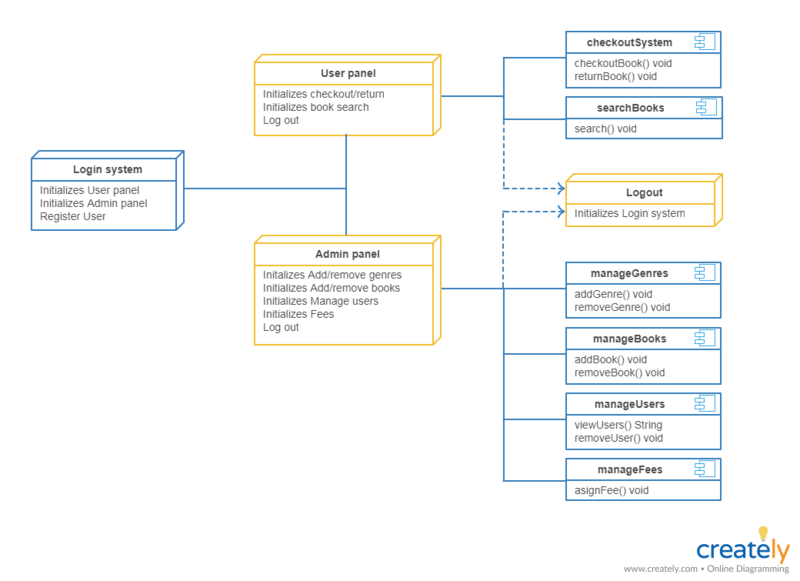 Use our UML diagram tool for powerful features that’ll make drawing UML diagrams easier. Last week we published a comprehensive tutorial on component diagrams and if you missed it, do check it out below with our other UML diagram tutorials. And don’t forget to leave your thoughts in the comment section below.